Especially used with sprains of the tendon in the front of the ankle joint (lig. tibiofibular anterior), where pain is experienced when flexing the foot powerfully upwards (dorsal flexion). This tape must be rolled loosely on, and must not be drawn tight. If the tape becomes tight all the same, which often happens, it must be loosened. 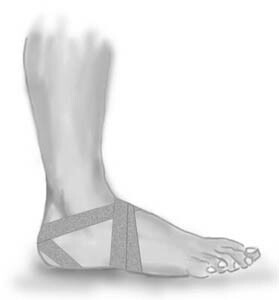 Application: Start at the back of the foot just in front of the ankle joint and draw the tape down around the outer border of the foot (A), under the sole and up to the back of the foot. Continue over the lower part of the ankle knuckle behind the heel under the Achilles tendon (B). The tape crosses down under the inner side of the heel and up to the outer border of the foot (C). The tape continues over the lower part of the inner ankle knuckle behind the heel under the Achilles tendon. The tape crosses the earlier tape, goes down under the outer side of the heel (D) and up to the inner border of the foot to finish on the back of the foot.